Are you tired of waking up early to put on the same makeup day in and day out? If you answered yes to this question, permanent cosmetics may be an excellent solution for you. An ideal treatment for women of all ages who want to look their best and enhance their professional image, permanent cosmetics utilize special techniques known as micropigmentation to deposit color into your eyebrows, lips, cheeks, and more. Permanent cosmetics can do wonders for your image and self confidence, which is why in this blog, we’re going to look at some major benefits of micropigmentation and permanent makeup. At The Perfect Look in West Lake Hills, we’re proud to be a leading provider of permanent cosmetics and makeup procedures throughout Texas. Our specialized boutique takes great pride in helping men and women look and feel more beautiful without the inconvenience of invasive surgery. Whether you’re looking to enhance the look of your eyes with permanent eyeliner or you want your lips to pop with permanent lipstick, we can help you achieve the look you’ve always wanted. Check out our gallery online to view some of our work or contact us today to schedule a consultation! It’s no surprise that permanent makeup has become extremely popular with the last five to 10 years. From famous actors and supermodels to articles in Vogue magazine, permanent cosmetics have become a convenient way for women and men to enhance their natural features. 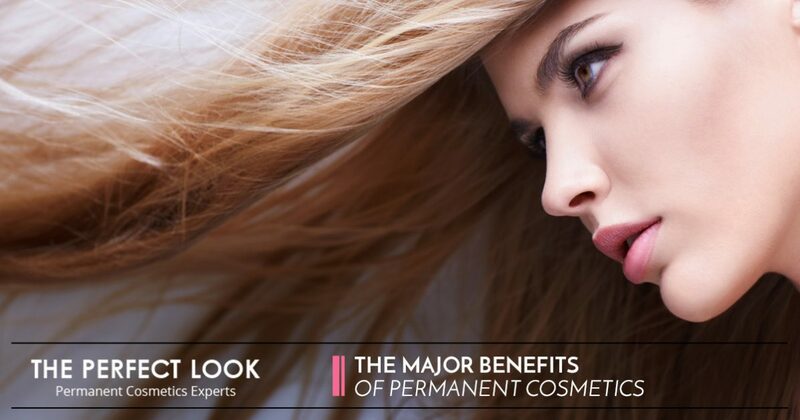 Let’s take a look at some of the benefits of permanent cosmetics and why you should consider permanent makeup in the future. If your skin is sensitive to eyeliner or you’re tired of putting on eyeliner every morning before you go to work, you may want to consider a permanent eyeliner procedure. From soft and delicate enhancements to bold statements, permanent eyeliner comes in a variety of styles and colors. Permanent eyeliner can enhance sparse lashes or give more definition to light or faded eyelashes. Since permanent eyeliner never smear, it’s an ideal solution for women who are tired of makeup that always smudges, and it can be especially helpful to those who have unsteady hands. Perfect for women who have busy and active lifestyles or for ladies who are looking for ways to simplify their makeup routine, permanent cosmetic eyeliner is a time-saving solution for a variety of people. If you suffer from sparse or light eyebrows, you may want to consider a permanent eyebrow treatment. Beautifully shaped eyebrows can enhance the eyes and draw attention to your cheek bones. It is also an ideal solution for people who suffer from alopecia, trichotillomania, or those undergoing chemotherapy. At The Perfect Look in West Lake Hills, we’ve helped hundreds of men and women improve the appearance of their eyebrows through our permanent 3D eyebrow procedures. Whether you’re interested in adding shape and lift to your brows for a more youthful appearance, or you’re looking for a way to add color and texture to your brows for a more dramatic look, our experts can help! When you visit our permanent cosmetics facility, our technicians will take the time to understand your unique needs before diving into your eyebrow enhancement. If you’re interested in learning more about permanent eyebrows or you have questions regarding the procedure, contact us today! Since your lips are one of the first things people notice about your smile, it comes as no surprise that many women throughout Texas have turned to permanent lipstick to enhance their appearance. When your lips are colorfully balanced and well-shaped, not only will your confidence soar, others will take note of your natural beauty as well. This is a great way to make your lips appear fuller and reduce the appearance of fine lines and wrinkles around the mouth. If you’re interested in enhancing the appearance of thin or light colored lips without the use of painful collagen injections, permanent cosmetics can give you the natural look and beauty that you’ve always dreamed. Do you have dark circles under your eyes that never seem to conceal no matter how much makeup you use? Do you suffer from unattractive scars due to an injury or accident? If you answered yes to any of these questions, permanent concealer may be a great cosmetic solution for you. Also known as corrective pigment camouflage, permanent concealer can help even out your skin tone for a more smooth and natural complexion. Through the use of permanent concealer procedures, you can save time and money while boosting your self confidence. When you visit a permanent cosmetics professional, your technician will work with you one on one to discuss your skin and complexion goals before discussing the details of your permanent concealer treatment. If you’re interested in learning more about permanent concealer, contact the professionals at The Perfect Look today! If you’re constantly on the go as a busy mom or business woman, you likely don’t have much time to dedicate to your daily makeup routine. From running back and forth to meetings to picking up the kids after school, applying eyeshadow once or twice a day is likely far from your list of things to do. That’s why so many women have turned to permanent eyeshadow to enhance their natural appearance. At The Perfect Look, we can help you achieve natural looking, multi-dimensional eyeshadow through our innovative and safe permanent cosmetics procedures. Whether you want to add a little more color to your eyelids for a hint of texture, or you’re looking for a shade that will complement the color of your eyes, our cosmetic artists can help you achieve the look you want. All of our permanent cosmetic beauticians have been highly educated in the latest and safest permanent cosmetics techniques and we’ll do everything we can to ensure your experience with us is a positive one. To learn more about our permanent makeup services or to schedule an appointment for permanent eyeliner, lipstick, eyeshadow, and more, contact us today! © 2017 The Perfect Look | All Rights Reserved.